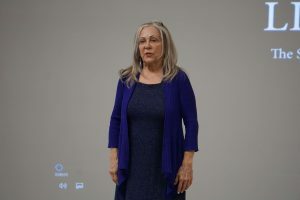 A film showing from Saint Petersburg College’s Elizabeth Indianos was held on Thursday March 27th. 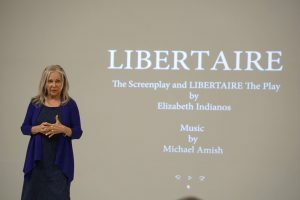 The filmed theatrical production was called Libertaire and described the trials and tribulations of the two men who fought for the construction of the Statue of Liberty. 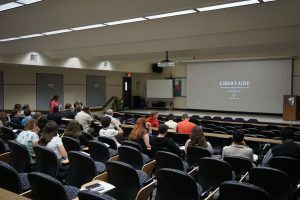 The showing began at 5:00PM in the Lyceum building. The staff offered popcorn and refreshments. There was already a large group of students who had arrived when I arrived before the showing. After a brief introduction by Indianos, the lights went down, and the showing of Libertaire began. The filmed theatrical production of the play follows the lives of the two main characters, Joseph Pulitzer and Frederic Bartholdi. These real people are portrayed through their struggles in life and during the planning stages of the Statue. These sentiments are as easily relatable now as they were over 100 years ago when the story takes place. The characters within the film both seemed to chase the “American Dream”. The struggle of Pulitzer as a new immigrant to the United States and his subsequent rise to the Pulitzer known by the award named after him, also Bartholdi’s dream to build the Statue and the difficulties present during that time in Europe were the focus of the screenplay. The art direction used by Indianos is evident throughout the film. Having used her unique style for the backdrops of the sets. The style is fanciful and surrealist with bright colors and contrast. It lends itself well to the story, with the realization of the absurdness of building such as large statue for another country. The reminiscent feeling of wonder for the history of such a well-known work of art worked very well with Indianos own style. Indianos has already been awarded many awards for the screenplay since its initial release. 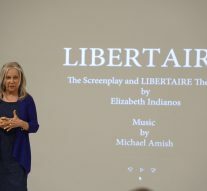 In 2017, Libertaire was awarded Best Screenplay at the Vancouver Film Festival and at the Life Long Island International Film Expo in 2016. These are just a few of the long list of awards it has received. Recently in 2018 the screen play was nominated for seven “Seven Star Award” categories. All the awards were well justified, as the story was intriguing. Throughout the film, the characters were developed without the dialogue becoming too overbearing on the historical facts. There is also enough humor sprinkled throughout the play to keep it just out reach of being a dry historical drama. Libertaire brought the idea of the Stature of Liberty down to something real. Even following the realization that the statue itself is only 111’ feet tall and the entirety of the statue is 305’; that’s smaller than what you would think. Some buildings in Tampa would tower over it. Yet, its image is one that is uniquely American and known throughout the world with its majesty and message amplifying its size exponentially. This screenplay by Indianos was something I am glad I did not miss. Its story and message are one that can run deep through any American foreign or national. The screenplay has been in planning to be produced into a feature film. Its story and characters not only present a legitimate example of perseverance through adversity but also provide a great example of what someone can accomplish. One can only hope that a faithful adaptation can be made that encompasses the scope and the size of this story.